Students at Saint Joseph’s are encouraged to form a lifelong commitment to thinking critically, making ethical decisions, pursuing social justice and finding God in all things. 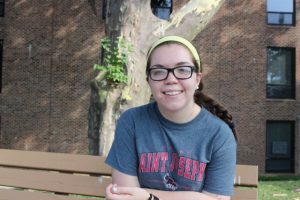 Theology major Erin Breen ’19 of Glenside, Pennsylvania, understood this when she took on her Summer Scholars project, which aims to examine the success of the current foster care system and its educational resources while evaluating its adequacy in terms of Catholic social teaching. She began her project by looking into the current condition of foster care in the United States by analyzing statistics on foster demographics, parental demographics, school changes, educational outcomes, incarceration rates, average time in care, and average age when the children leave foster care. She is taking this research and connecting it to Catholic Social Teaching, which she will use to analyze whether or not the system is ethical and discover ways to improve it. She is working under the guidance of James F. Caccamo, Ph.D., associate professor and chair of theology and religious studies. Caccamo’s work has focused on Catholic social ethics, and he believes that Breen’s project has potential to add to the conversation about foster care and education, especially through the lens of Catholic education. Breen is also a Kinney SCHOLAR and Writing Center tutor; she participates in Campus Ministry retreats, immersion trips and is part of Christian Life Communities. She will also be a residential assistant in fall 2017. Mentor: James F. Caccamo, Ph.D.